About one out of every 110 children has an autism spectrum disorder according to the latest CDC data. Between 2002 and 2006, the prevalence increased by an average of fifty seven percent! It is estimated that nearly one million Americans have been diagnosed with autism spectrum disorders. Parents raising these children often feel like they face more questions than answers. Published in time for Autism Awareness Month, Cutting-Edge Therapies for Autism 2011-2012 gives parents the information they need to help their children while helping the parents themselves cope with their situation. 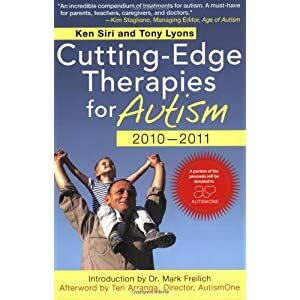 The first edition of Cutting-Edge Therapies for Autism , which was released last year, literally flew off of the shelves! This year, the book’s second installment of the annually updated series includes additional, groundbreaking information that will be of essential use to parents everywhere. Readers of Cutting-Edge Therapies for Autism 2011-2012 will gain a wealth of knowledge and coping mechanisms to employ. Learn how animal-assisted therapy such as horseback riding advances developmental growth; art therapy encourages self expression; and play therapy teaches communication and environmental awareness. Music, speech, language, and even aquatic therapies are also explored. What was amazing about this book was how complete it was. It is packed with pretty much any therapy you can think of in regards to helping those with autism. From medicine to behavioral therapies, this book seemingly has it all. Because the book is SO complete, you basically need to treat it like a reference guide. With this in mind, the book is set up in this way and is easy enough to read and understand. I liked the fact that the book was neutral on the different treatments, allowing the reader to make a determination for themselves, too many authors would rush to judge and prescribe a set treatment, but not this author and not this book. The book is arranged alphabetically by therapy which allows you to find a specific therapy that a doctor or therapist might mention and read up more on it. I highly recommend this book for anyone who has or is working with an autistic child!